Earlier today I set you the following puzzles. 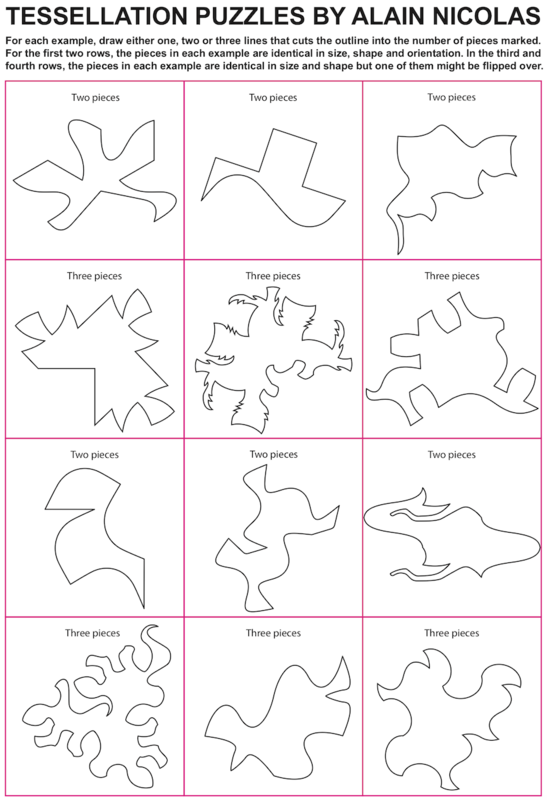 The challenge is to divide each of the following outlines into the number of pieces indicated. In the first two rows, the pieces in each image have the same shape, size and orientation. In the third and fourth rows, the pieces have the same shape and size but one may be flipped over. Click here for a printable version. The images are all drawn by tessellation artist Alain Nicolas. The answers are here – the shapes and an example of how they tesselate. I hope you enjoyed these puzzles. I’ll be back in two weeks. Thanks to Alain Nicolas for today’s puzzles. You can check out his amazing gallery of tessellations here.